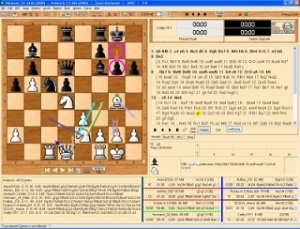 Arena, a free Graphical User Interface for Chess Engine Communication Protocol and UCI compatible engines running under Windows, and since November 2016 Linux , developed by Martin Blume . The development started in 2001/2002 motivated and initiated by WinBoard aficionado Frank Quisinsky. The Arena team, soon maintaining their own website and support forum, was advanced by Christopher Conkie, Michael Diosi and a lot of other people for Language translation and Opening Book support, for instance Harry Schnapp, Đorđe Vidanović, Carlos Pesce and Dann Corbit to name a few mentioned on the Arena site  . They initially set up an Arena Security Area for registered download of the GUI and the bundled Arena partner engines. In 2004 there was an attempt by Frank Quisinsky within the Gladiator-Shop to commercialize Arena bundled with engines such as Ruffian , Patriot  and Ktulu  . The Gladiator project was abandoned after suspicions that the new Patriot 2.0 was based on Fruit  became substantial in May 2005 . Arena 3.5.1 is the recent version, available from the Arena download site  . There were several reasons why I've pulled out of the project. 1st With their arena and proceed to the spread of computer chess, there were different perspectives on Martin and myself. For example, I had built up just before the break a lot of contacts with Asian firms. Stupid was that some truth in both views was. So I realized that not enough time to implement, for example, my future goals. The team was too small. My own goals fell into a tailspin. But I want to write anything. Probably it would have been so but now that we have had in about 3-5 million downloads, computer chess world would have had a higher level of awareness. 2nd Added to this was that I no longer even afford the time could. His time a new job, etc.. Also stole a lot of time useless. The forum was argued only the administration and robbed continually important time. Martin also saw the way other members was unfortunately not in the team for the Forum sacred. But in a small team must be set Prios. 3rd What turned me off that everyone helped himself without asking. His term discussions in chess talk. Even the administrators of chess talk did not intervene. Arena was or is indeed freeware, but for future releases should be asked. We wanted to know who uses the Arena and whether our interests are safeguarded so. I had no interest in that the good reputation of the very hard work had gone before, is not ruined by the people involved. So it was that time in the copyrights that require approval of a further publication. Freeware is not necessarily just because a program is freely available. 4th I really dislike it, the arena team that captured people like Christopher Conkie, Arena used to fighten against other programs. It was not in my interest in using other software developers arena to point out any errors. Arena has to focus on the development itself and not on other programs. Sun came slowly but surely also a shame to the reputation of the project in danger for me and my name was on a long term. Unsubscribe private wars under the flag arena ... I absolutely refused. Under these circumstances, I did my time no longer provide. Thus, on my website texts that I had added, deleted, even by Christopher Conkie. That went too far for me. As Martin, with whom I was coping very well, not relenting was ... I thought, well now Martin will be happy with Christopher Conkie. If you support these activities around arena, but not together with me please. Eventually, Martin was certainly very disappointed but we were not together anymore ... probably noticed ... without which we would now argue, etc.. We also have no contact. 3x've tried to contact him but he responds to recover any of my e-mails. And the Arena GUI itself: For me, this program is in the midst of development. The many ideas are still far from complete. I look at arena with different eyes than perhaps a user who is satisfied with the features comes up with the current arena. Insofar as I can with the program on time, in this state, not make friends more and avoid arena ... only see a construction site when I would start arena. Also due to the fact that I have sooo much time invested. Thus ends at some point once a team work, which has raised such a popular project. Despite free software, the Arena team demands downloads from their own site and combats illegal hosting  of the GUI, the engines as well as their Web content. That also refers to interviews with programmers, which were copied even without citing the original source. Over the years they suffered not only from illegal hosting but during the time also from attacking their site. Their former ExactaChess site is closed now, the new site appeared in January 2011. However, it is not appropriate for the current Arena support team around Michael Diosi to attract attention by offensive public statements against their commercial and free software competitors    , to defame people from Eastern European countries for not citing the source , and to react on the other side oversensitive after Harm Geert Muller used the phrase To each his own  concerning the number of hits of the Arena site, as mentioned by Diosi  . This page was last edited on 1 June 2018, at 18:32.